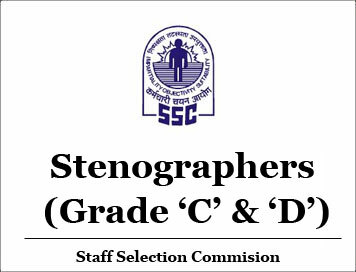 Stenographer Grade ‘D’ Dictation: 10 minutes @ 80w.p.m. Stenographer Grade ‘C’ Dictation: 10 minutes @ 100w.p.m. 4. 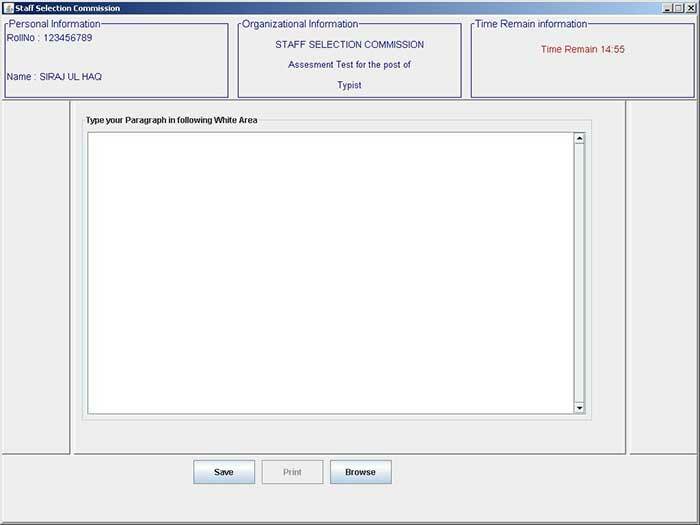 Candidates are required to bring original copies of the following certificates/documents along with attested copies thereof at the time of test, failing which; they may not be admitted to the test. i. Matriculation or equivalent certificate in support of date of birth. ii. Education Certificate in support of educational qualifications. iii. SC/ST/ExS/OBC/PH certificate in the ‘PRESCRIBED’ format issued by the competent authority, in case candidate belongs to any such category. iv. “No Objection Certificate” if the candidates is in Central Government Employment and seeks age relaxation available to such eligible candidates. v. A recent passport size photograph. vi. A photo bearing identification certificates such as Passport, Voters Card, Driving License, Pan Card etc. 5. Traveling and other expenses must be borne by the candidates themselves. 6. 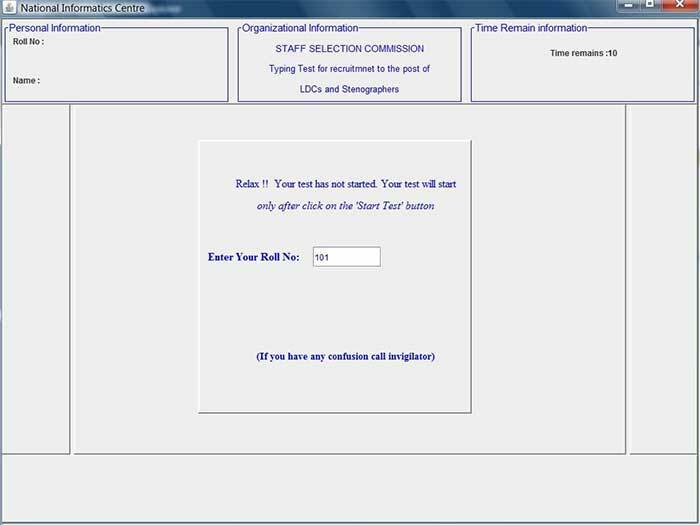 The candidates will be required to take their seat ten minutes before commencement of the Stenography Test. 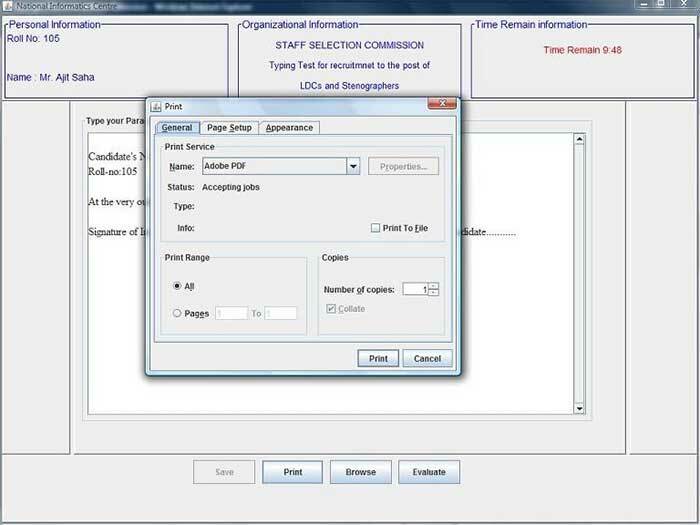 If the computer goes out of order during transcription, the candidate should not shout or disturb others, but should remain seated quietly and inform the Invigilator. 8. Candidates shall be given two trial passages each of one minute’s duration which need not be transcribed. Thereafter, the actual passage shall be dictated. As soon as it is over, the candidates shall return to the transcription room and read their shorthand notes silently for ten minutes. The time for the commencement of the transcription will be announced by the Invigilator/Venue Supervisor as soon as the reading time is over. Thereafter, they will have to complete their transcription including comparison, correction etc. within the stipulated time. The candidate shall have to transcribe the shorthand notes in DOUBLE SPACE. 9. 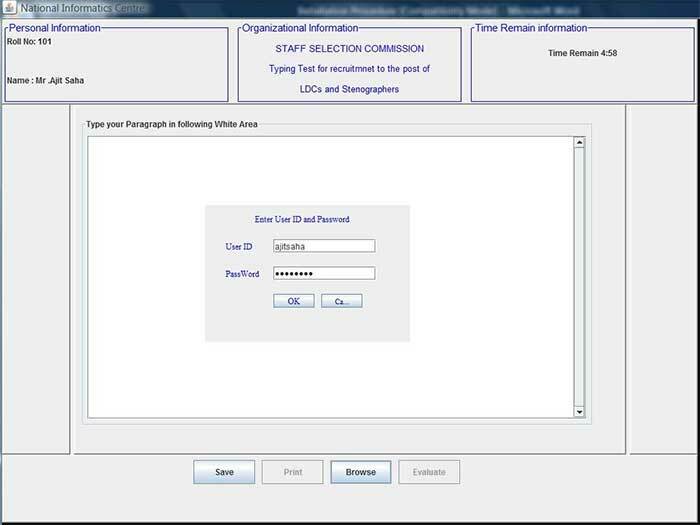 Immediately after the Stenography test is over, the candidate will have to write in his/her own handwriting one paragraph of about 50-60 words from the Shorthand passage given to him/her on a separate sheet and will have to write his/her name and Roll No. and affix his/her signature at the end. 10. Candidates should not tear any sheet given to them. When the printout of the transcript typed by him/her is given to him/her, he/she must write his roll no. and name on each page, sign and handover the same to the invigilator” along with the Shorthand Note book. Candidate are advised that the Shorthand Note book is scrutinized by the Commission before finalization of the result of the skill test. 11. Candidates should not take either script or any blank typing paper out of the Examination Hall. 12. 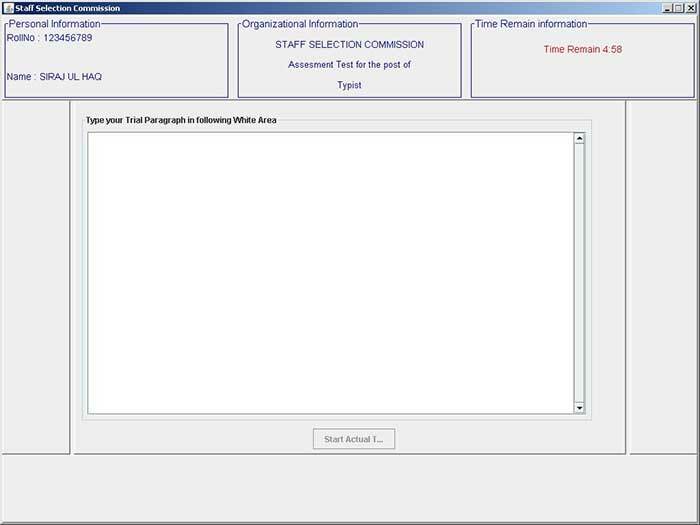 Every candidate will be supplied with a photo bearing attendance Sheet with his/her Roll number. He/she will be required to sign it and put his/her Left Hand Thumb impression before the beginning of the Test. 13. Candidates shall not be permitted to leave the Examination Hall until the expiry of the Test. 14. On completion of the test, they shall remain seated at their desks and wait until their scripts are collected and accounted for. They must not type, write or erase after the expiry of the allotted time. 15. Silence must be observed in the Examination Hall. Smoking /chewing tobacco in the Examination Hall is strictly prohibited. 16. Candidates must abide by further instructions, if any, which may be given to them by the Supervisor. If any candidate fails to do so or indulges in disorderly or improper conduct, he/she will render himself/herself liable to expulsion from the Test or such other penalty as the Commission may deem fit. 17. Any request for change in time/date/centre/medium of the test will not be entertained by the Commission under any circumstances. 18. Possession of mobile/cellular phones (whether in use or not) in the examination hall is strictly prohibited. Failure to do so shall invite disciplinary action as the Commission may deem fit, including cancellation of candidature. Candidates are advised in their own interest not to bring these gadgets to the examination venue as there will be no facility for safe-keeping. 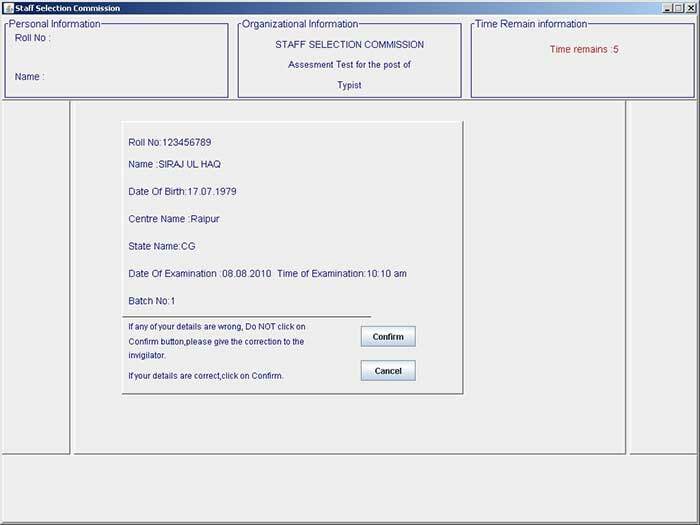 Step-2: Candidate’s profile appears on the screen, press confirm button if Candidate’s profile is correct or call Invigilator. When the duration of the test is over candidate would not be able to type further. 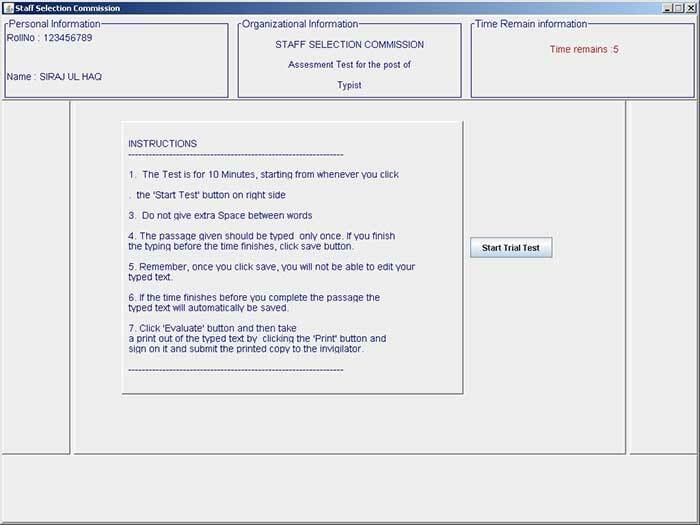 Note: Duration of the Actual Test will be 10 minutes for typing and 15 minutes for data entry/word processing. For transcription of stenography, the duration for transcription will vary depending on speed of dictation and language. Step-4: The following white space area will be visible to you for typing after pressing the ‘Trial Test Button’. At the bottom of the page, ‘Start actual Test’ button will also appear. When trial test is over then, White space area will be disabled so that you cannot typed further, and ‘start Actual Test’ button will be enabled so that you can start your actual test. Step-5: When you press ‘Start Actual Test’ then actual test will commence. The actual test screen is shown bellow. Note 4: The Commission will not be responsible for loss of data due to failure to press the ‘SAVE’ button. Note: In case of Hindi Typing Remington keyboard and Lohit Hindi font have been used.